Thierry Mugler does not make fragrances; he creates goddesses experienced through the medium of olfaction. His modest collection of perfumes traverses the galaxies and the heavens to bring us odours that challenge and beguile, but also create addiction – a MUGLER perfume is for life, they say, not just for Christmas. ANGEL is the celestial diva – a showgirl born out of a supernova and ALIEN is a solar force – a benign entity powered by the vibrant energy of amethyst. Now ANGEL and ALIEN have a third goddess to share their spotlight with and I have a feeling that this new queen in their midst will have them both absolutely green with envy. Please be upstanding for MUGLER’S new animal – the alluring AURA. AURA is a mixture of the animal and the botanical. It’s a fragrance composed of three hearts, with innovative materials and overdoses aplenty. It is also completely atypical for MUGLER, with a softer, more approachable signature, and dare I say, much more of a commercial appeal. But fear ye not, MUGLER lovers, because AURA does not shy away from those things that make MUGLER great – the divisiveness, the power, the glamazonian strength – instead it showcases each of these things in an entirely new way. AURA is an entirely new breed of MUGLER – an exotic animal only found in the forests of Planet MUGLER – and it’s one you are absolutely going to want to get acquainted with, so acquainted we shall get. AURA opens juicy and tart with a wave of fresh greenery. Smelling it, one thinks of a lush rainforest, dense with giant palm leaves filled with rainwater. The opening is sappy and leafy, but there’s also this indefinable luminescence to it, almost as if the greenery in this lush forest is alive with fiberoptic energy. 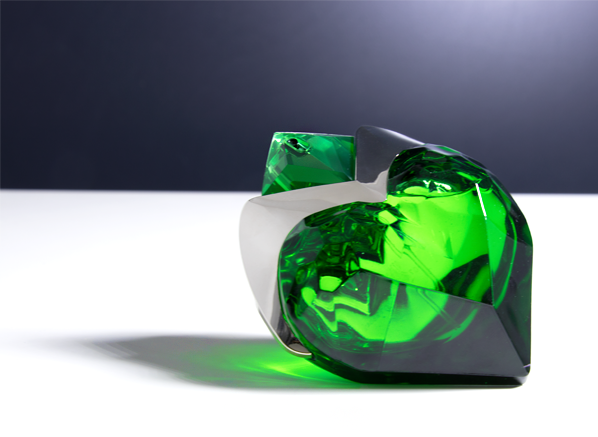 AURA is Amazonian right from the very start and it challenges one’s notion of what the idea of green in a fragrance can be, and as with all things MUGLER, it has a distinct signature that is wholly unique. The core of AURA centres on two intriguing materials: wolfwood and tiger liana. Wolfwood adds a smoky, dry quality that contrasts all of that juiciness rather nicely, whilst the tiger liana, which is a Firmenich material used exclusively in AURA (tiger liana is a code name bestowed by MUGLER – you won’t find this in your local florist, FYI) boosts the leafiness and sweetness with an intriguing sugared almond effect. What I love about AURA is the ever-evolving swirl of nuances that create a hypnotic sense of intrigue throughout the fragrance’s development. Unlike ANGEL and ALIEN which are immediately interesting due to their olfactory clashes, AURA takes time to unfurl its many intriguing facets, but as they are revealed, it’s impossible not to be fascinated by them. In the base, AURA continues her intrigue with a very MUGLERIAN material: vanilla. Now, if you’re thinking that a juicy, sugary yet somehow smoky green fragrance could perhaps be pushed over the edge of acceptability with the addition of bourbon vanilla then you would be wrong (you would also be wrong in thinking that MUGLER cares about what is acceptable – in fact, a MUGLER fragrance dares to be unacceptable) – it absolutely works. For me, the vanilla rounds things off nicely and it’s the glue that holds everything together. It pulls that juicy, sweet quality of the rhubarb and greenery into the very heart of that smoky, woody quality, merging two polar opposites together and adding richness, and a fullness to the fragrance. Finally, let’s talk bottle because we all know that when it comes to flacons, MUGLER does not simply create vessels to carry perfume, no, they forge works of art. AURA follows every other MUGLER fragrance by finding itself housed within a glass sculpture that is as beguiling as the scent itself. 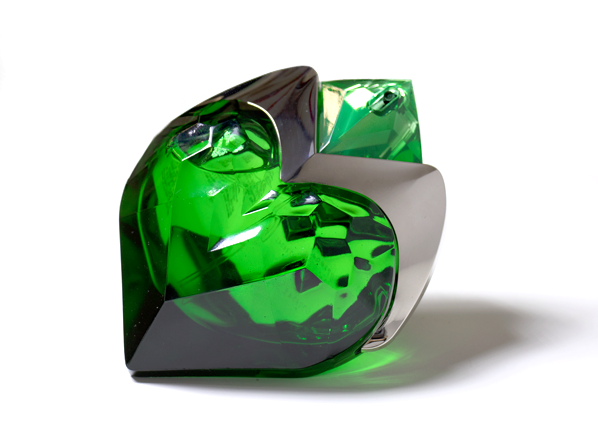 Instead of a star or a jewel, this bottle is an emerald-coloured heart cut like a diamond with scale-like facets, hinting at a reptilian aesthetic. A silver ‘M’ tops the flacon like a crown, cementing AURA in the MUGLER hall of fame as one of the designer’s fragrant queens. It’s very much something one would find in the Wizard of Oz’s cupboard in the Emerald City and I honestly think that it is MUGLER’S most beautiful bottle to date. AURA is a brand new type of MUGLER – one that does not go for olfactory shock but instead celebrates the harmony in materials over potential discord. It may not be as daring or as divisive as ANGEL or ALIEN, but it is just as complex and beautiful. With their fragrances, MUGLER likes to create addiction, with irresistible scents that draw one back time and time again. AURA is one such fragrance. Its animalistic instinct will track you down and once it does, you have no choice but to nuzzle into its three boldly beating hearts. If you found ALIEN or ANGEL too OTT then AURA may just be the MUGLER for you. But if you didn’t, and you’re a die-hard MUGLER fan (all the best people are), well then AURA is a no-brainer! This entry was posted on Wednesday, November 22nd, 2017 at 9:05 am and is filed under Candy Perfume Boy, Fragrance, New products. You can follow any responses to this entry through the RSS 2.0 feed. You can skip to the end and leave a response. Pinging is currently not allowed.